Join us for another Ken and Robin live episode, this time from beautiful and now slightly better smelling Indianapolis, Indiana. We nerdtrope magical slave revolts, fit the Fords into the Cthulhu mythos, riff on our favorite spice, and more. Hurtle back into mid-August with us! Lead sponsor Atlas Games alerts you to a project near and dear to Robin’s heart, not to mention a good chunk of his year so far. 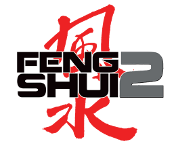 That would be the freshly inaugurated Kickstarter for Feng Shui 2! Head on over and help add as much awesome as possible to the new version of the action movie roleplaying game. This entry was posted on September 19th, 2014 at 8:30 am and is filed under Podcast. You can follow any responses to this entry through the RSS 2.0 feed. You can leave a response, or trackback from your own site. I love your show. I almost always listen to it on the first day of release. Now that the Feng Shui 2 kickstarter is in full swing, I have a question. What movies that weren’t out when Feng Shui first came out were inspiration for this edition? 1.) Where’s the best place to Ask Ken & Robin things? 2.) Any ideas on how a GM could run an F20 campaign filled with “gotcha” traps and the constant peril of sudden character death, and make it fun for the players? I love the horror movie menace of adventures such as “Return to the Tomb of Horrors”, but I can’t imagine your typical F20 player actually enjoying it. Right here, in the comments to any post. I’ve added your question to the hopper! Great live show guys & surprised at how well the audio turned out for the convention setting. I think that your idea for doing a Dr. Who rpg using another system apart from the current one is a good one. Out of all the systems I’m well enough used to included the much beloved BRP system from Chaosium, the only one that would seem good for balancing the Doctor with everyone else would be the Fate Core system. Loved the idea with the mix of the voodoo priests going to the farther corners of the world into Babylon and elsewhere which would be quite the rich mine to get gems of ideas for games/fiction. Agreed 100% about the recruitment branch of horror storyline in a game, ‘Than Curse the Darkness’ from one of the Books of Cthulhu was a nice gem that ‘s easy to transplant into a small island or imprisoned community oppressed by some bigger force wanting to help the cosmic forces which leaves the players to figure out on which option is the better one as they clearly are up to their necks to where they can’t just leave. Always glad to hear the Ken & Robin podcasts & keep up all the great gaming work. Mutant City Blues recommends that you use your hometown as setting. How is this best handled if you live in a small town, or even a country with no really large cities? Ask your players to suggest cities they feel familiar with which are big enough for crime and crime drama. Multiple small towns add up to a big enough place. See, for example, Wallander or Adrian McKinty’s Sean Duffy novels. At 38:12 you mixed up George Eberhart (author of A Geo-Bibliography of Anomalies: Primary Access to Observations of UFOs, Ghosts, and Other Mysterious Phenomena ) with William Corliss (author of the Sourcebook Project). I’ve had that red powder on roasted corn before from a stand on the Danforth. You BBQ (propane grill for Ken) corn on the cob, already husked, and then when the corn is nice and caramelized you take half a lime, dip it in the spice, then rub it all over the corn.